I spent a nice long ride on the train with figuring out the thing and produce a little mix. 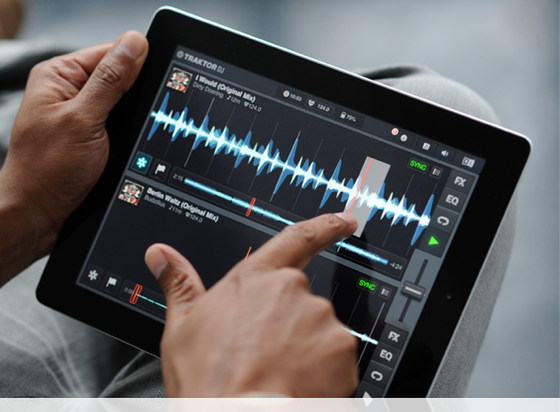 The app runs smoothly and is very intuitive, it comes with effects like looping, delays, flangers and filters or freezes. The freeze function is certainly the most innovative. While in a loop, you can touch certain parts of the loop and play it, like single drums or sounds. While playing, mixing or skipping, it never gets out of synch, and combined with a soundcard you can send different sound signals to master and prelistening. So this is actually a serious alternative for a gig in a bar, maybe not in a club. So here it is, enjoy 30 minutes of bass music with Benga, Kryptic Minds, Redrum and Fused Forces.